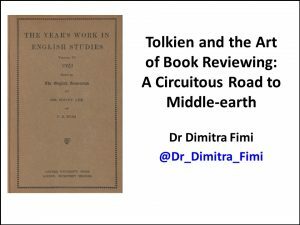 The Tolkien Society has just uploaded on YouTube my talk for Oxonmoot 2016, titled: “Tolkien and the Art of Book Reviewing: A Circuitous Road to Middle-earth”. I thought, therefore, that it would be a good idea to publish the text of the talk and slides too. The talk focuses on Tolkien’s three book reviews on “Philology” for The Year’s Work in English Studies, published between 1924 and 1927. I start with some general observations on academic book reviews, their challenges and pitfalls (so this part may prove useful for postgraduate students and early career researchers), and then I present some links between Tolkien’s book reviews and some of his lifelong concerns and interests that fed into his literary creativity. 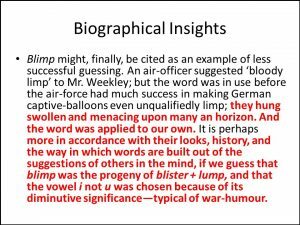 Please note that the talk has been written to be delivered orally (rather to be published) so it includes colloquialisms and the referencing (though included) does not follow any specific referencing system religiously. So, Book Reviews. Book reviews are undoubtedly a useful thing. If you’ve just picked up a book, any book, chances are that somewhere in the front or back cover there will be an extract from a review, attempting to convince you to read it. From the columns of national newspapers and periodicals, to the reviews submitted on Amazon, Goodreads and other such platforms, book reviews are ubiquitous, can be very influential, and – apparently – nowadays any of us can submit them. In terms of the first point, well, book reviews are often the locus of “showing off”. Yes, says the confident reviewer, I know the field pretty well, I can explain to you VERY clearly what this book brings to the debate that is fresh and new, or I can equally rubbish it because “that’s already been said, in fact by Professor x in 1997”! In terms of the second point, in preparation for this talk, I was having a look at book reviews of my first book, on Tolkien. (Of course I had read them avidly back then, but it was interesting to look at them again after a considerable time distance) and the review for the journal Tolkien Studies was markedly different in focus and tone from the review for the journal Folklore, or for The Times Literary Supplement. Good reviewers are supposed to cater for their readers. At the same time, though, there are traps and pitfalls when you have a book review to do, one of which is personal relationships. Suppose you have been asked to write a review for a book written by a good friend, or esteemed colleague, or even a mentor, and you end up thinking that the book is, well, how shall I put this, not that brilliant! Academia is a small world and these things happen – how do you deal with that? To make matters worse, all of the difficulties and intricacies mentioned so far (the wide, authoritative knowledge of the field, the clear understanding of the niche interests of your readership, AND the issue of personal acquaintances) come to a violent clash when it comes to the people who are often the ones to be asked to do book reviews more than any: PhD students or recent graduates, or early career academics. Yes, I can feel the shivers going up and down the spines of those of you in the audience that have one due to be submitted soon! For all the reasons I outlined a minute ago, they are daunting, cumbersome and generally a rather unwelcome task. And yet, younger academics who are keen to build a track record of publications often begin with book reviews and cut their teeth in a task that is pretty tough, but can really pay off if you get it right. 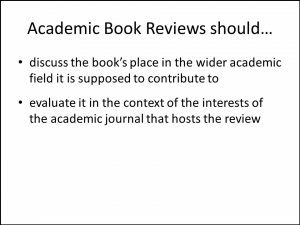 The best book reviews are those from which you learn something, and the exceptional ones are those that contribute to the relevant academic debate themselves via the act of critically evaluating another scholar’s work. I know, it’s tough, but it HAS to be done and it CAN be very rewarding. 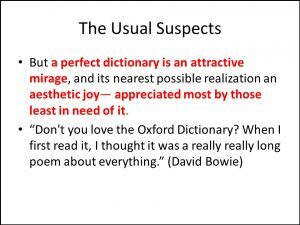 Now, why have I started this talk with such generalizations about book reviews in academia, reflecting – I assure you – on the dread and ennui of having had to do them, pretty regularly, for a good few years of my academic career? 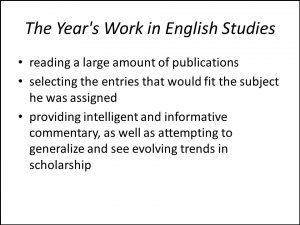 Well, because the subject of my talk is Tolkien’s own academic book reviews, all three of them, published between 1924 and 1927 in the journal The Year’s Work in English Studies (YWES). Tolkien was – at that point – exactly in the position most academic book reviewers are today: what we call now an “early career academic”. 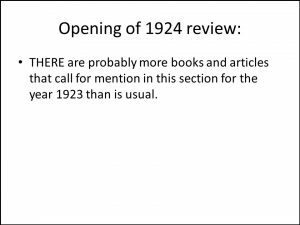 When the first of these reviews was published, he was still at his very first academic post at the University of Leeds (appointed only four years before), and by the time the last review was published he had only been in his next post at Oxford for two years. He was, therefore, within 10 years of beginning his academic career – exactly the definition we use today for early career academics. I should also note that the books Tolkien reviewed in these three volumes were not only in English – he also read them in German, French, and even modern Icelandic. 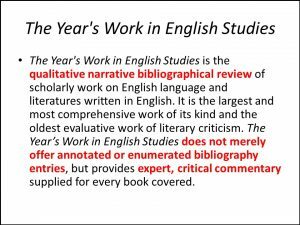 At the same time, it is important to note, I think, that although The Years Work in English Studies rightly boasts today to be “the oldest evaluative work of literary criticism”, at that point it was a relatively new publication, so reviewers must have felt the burden of responsibility to do a good job, establish the journal, and make it successful (as they clearly did). 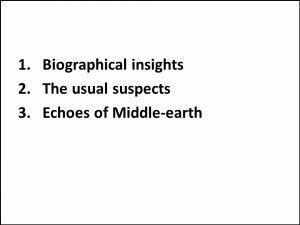 A look at the names of the reviewers that preceded and followed Tolkien in writing the review of books on “philology” for the journal reveals some that Tolkien scholars will recognize: E.V. Gordon (Tolkien’s friend, colleague and co-editor of Sir Gawain and the Green Knight) did the “philology” review the year before Tolkien started his, and a few years later Charles Leslie Wrenn (who succeeded Tolkien as Rawlinson and Bosworth Professor of Anglo-Saxon at Oxford) took over for two consecutive years. 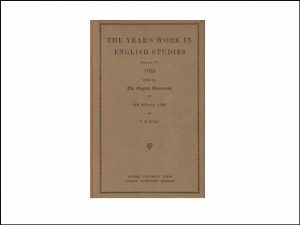 By the way, the last reviewing article on “philology” the journal ever published was in 1940 – after that the topic was eliminated from the journal’s contents, perhaps elements of it subsumed into Old and Middle English, etc. 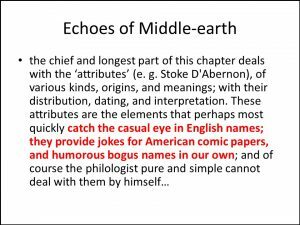 This is, I think, a clear reflection of the loss of favour and popularity philology suffered in the second part of the 20th century, a process that Tolkien was already seeing in the 1920s – of which, more in a minute! 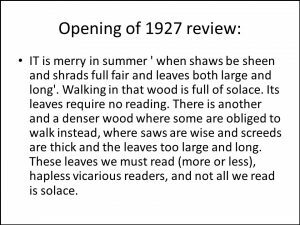 As I said before, Tolkien wrote these reviews for three consecutive years, and the toll they took (as well as Tolkien’s own humorous reaction it) are directly reflected in the opening section of each review. So, naturally, let me begin at the beginning with the three openings in quick succession. So here we have the “look, this is nigh on impossible” sort of declaration, but also – interestingly – a sort of “Homeric” simile that gives as a little glimpse into Tolkien’s views on the Great War (from which he had returned only 10 years before). 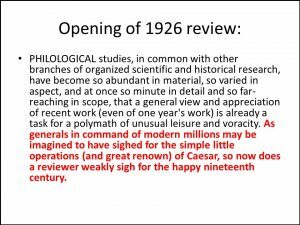 Notice how the “generals in command of modern millions” – the new model of war in the 20th century – are unfavourably compared to the “little operations” but also the “great renown” of Caesar. Both “expeditions” – of course – were of pivotal historical significance, changing Europe in an unprecedented way. But, to me, it sounds as though Tolkien is also criticising not just the effectiveness of modern war, but also its idea of heroism, its worthiness to gain “fame” – “renown”. 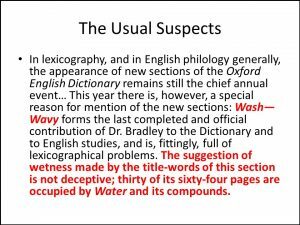 The comparison is apt and hits the nail on the head: there are so many scholarly works on philology now that the poor reviewer can’t hope to read all of them, not even those written in one year, but back in the 19th century – with such giants as Franz Bopp, Wilhelm Grimm, Wilhelm von Hamboldt, Max Müller, and others – there was less to read AND it was better, or more important. 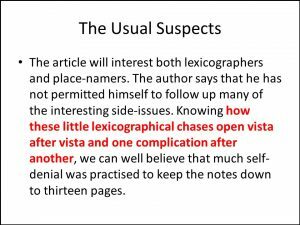 Yes, the work of these pioneers wasn’t right in all of its minute details, and they were usually interested in bigger themes rather than painstaking studies of one word, for example, but – gosh! – their “big ideas” were transformative: they gave birth to an entire new scholarly field. Tolkien and his contemporaries are – like Men to Elves – just followers. To hear the small bird’s song. IT is merry in summer ‘when shaws be sheen and shrads full fair and leaves both large and long’. Walking in that wood is full of solace. 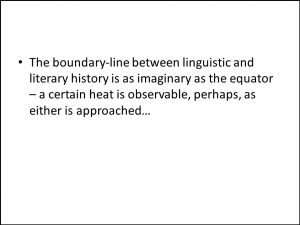 Now if I have it right, I don’t think anyone else has identified the quotation before – and if I am wrong I am sure one of the eminent scholars in this room will tell me so. 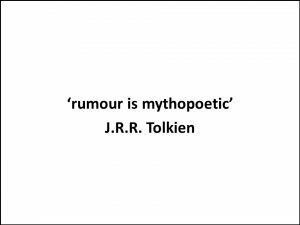 We also know that Tolkien had heard a paper by G.B. 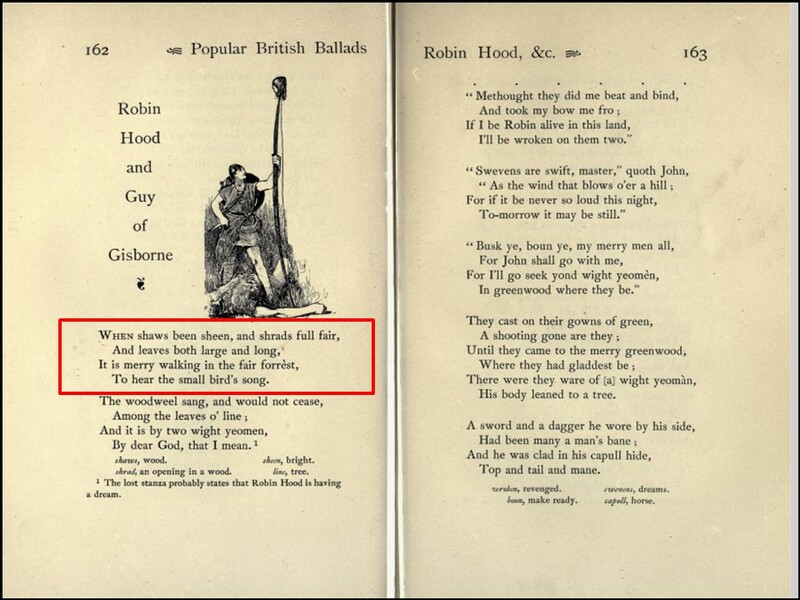 Smith on “Early English Ballads” in King Edward’s School in 1911 (Garth, 2003, p. 352), so there’s clearly a bit more sleuth work to be done here, and perhaps a reconsideration of Tolkien’s knowledge of the Robin Hood legend and what bearing this may have in his portrayal of “outlaws” in the legendarium – of which there are a fair few. Let me take these one-by-one: starting with biographical insights. I talked a minute ago about Tolkien’s comment on the Great War, as opposed to the more glorious wars of antiquity. 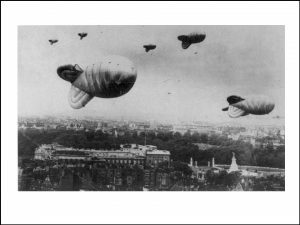 It shouldn’t surprise us that comments and asides about the War found their way in Tolkien’s book reviews – after all this was all a very recent (and rather painful) experience for him. Characteristically, he handles such references with humour, but also with a certain bitterness at times. 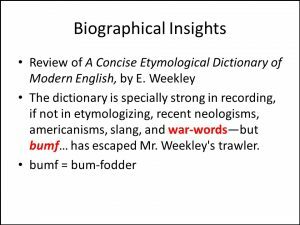 These remarks are tempered by regret that they do not reflect more plainly the cordiality with which we should wish to greet any mark of attention shown by French philology to English matters. 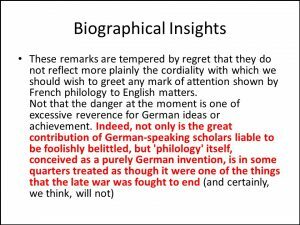 No, its German scholarly origin and tradition wasn’t the only reason for the decline of philology, but it certainly didn’t help. Tolkien here is “fighting the long defeat” through his review – all the more heroic because unsuccessful. To me this brings to mind “Leaf by Niggle” again, and the attention to detail that opened up Tolkien’s imagination to consider further minute details, leading to other details, both in his legendarium and in his scholarly work, thus NOT practicing “self-denial” and neglecting the larger “tree” of his mythology, or of his academic writings. 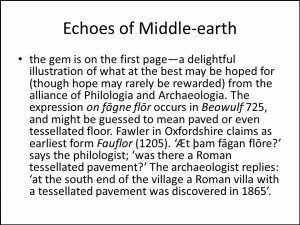 Tolkien reviews both sets of entries magnanimously, but he also takes the chance to question them when they didn’t take up his own etymological suggestions during his preliminary research. 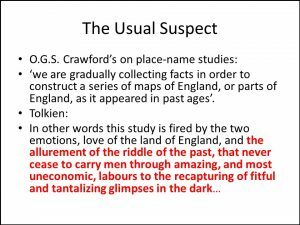 Well, if the entire project of Tolkien’s mythology is not the prime example of an “amazing, and most uneconomic, labour” to recapture “fitful and tantalizing glimpses” of England’s mythical/imaginary past, then I don’t know what is! 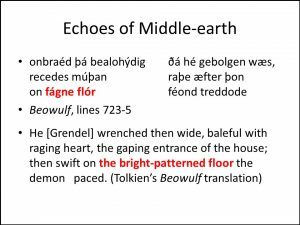 Tolkien also mentions other research into Old English texts and motifs that we know were significant for his legendarium. He comments on a new article “on the OE. 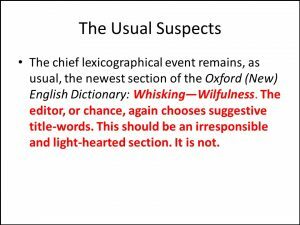 charm against elfshot” (Tom Shippey has linked this with Tolkien’s elves’ skill with archery) and on a proposed new etymology of the name Beowulf, yielding the sense “wind wolf” rather than the usual “bee wolf”, i.e. bear. And, by mentioning Beowulf, I am now passing into my third category: echoes of Middle-earth in these book reviews. 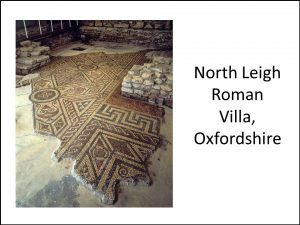 And here is the tessellated pavement in the Roman villa in Oxfordshire that the article Tolkien has reviewed is referring to. 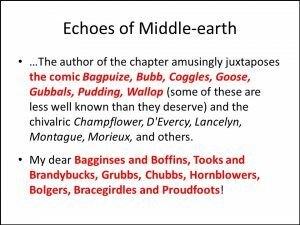 If the hobbits are another aspect of Tolkien’s representation of Englishness, then those names are fittingly English and comic, very much in the spirit of the names cited in the essay Tolkien reviewed. I would like to close this paper with a few more gems from Tolkien’s reviews, which I will not analyse or discuss too much, but which I wish to leave with you to ponder about, and which may reveal further aspects of Tolkien’s intellect, creativity and humour. 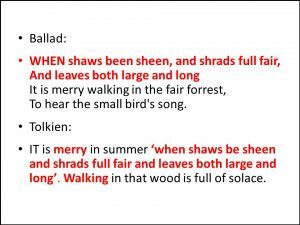 Here we are back in the ‘lit’ and ‘lang’ territory and Tolkien’s creative use of imagery from geography to show that these two are not as separate as his colleagues may want to think – indeed, the line that divides them is as “real” as the equator. 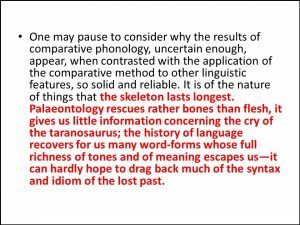 So yes, philology can rescue and restore the “skeleton” of dead languages, its bare bones, its main structures and characteristics. But it cannot bring it back fully alive – it can’t give us idioms, syntax, connotations, pronunciation. Just like palaeontology can’t tell us how the dinosaurs sounded like. Philology, therefore, satisfies both of Tolkien’s well-known desires: the re-discovery or restoration of the past, but also the inevitable gaps in our knowledge, the romance of things of the past that are now lost forever, and we can only imagine them and attempt to recapture them in fantasy. 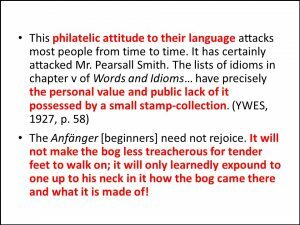 Here Tolkien manages to insult both Mr Pearsall Smith and philatelists with small stamp-collections! Thank you ever so much for listening! Garth, John (2003) Tolkien and the Great War: The Threshold of Middle-earth, London: HarperCollins. Johnson, R. Brimley (1894) Popular British Ballads: Ancient and Modern, Vol. 1, London: J. M. Dent; Philadelphia: J. B. Lippincott Company. Ryan, J.S. (2004) ‘Folktale, Fairy Tale, and the Creation of a Story’, in Isaacs, Neil D. and Zimbardo, Rose A. (eds.) Understanding the Lord of the Rings: The Best of Tolkien Criticism, Boston: Houghton Mifflin. Tolkien, J.R.R. (2004) The Lord of the Rings, 50th Anniversary Edition, edited by Wayne G. Hammond & Christina Scull, London: HarperCollins. Tolkien, J.R.R. 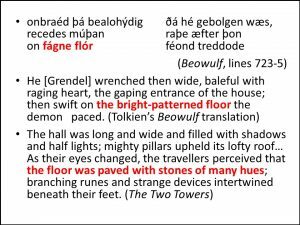 (2014) Beowulf: A Translation and Commentary, Together with Sellic Spell, edited by Christopher Tolkien, London: HarperCollins.